While departing from London last November, I was struck by a sushi restaurant in Heathrow prominently featuring the phrase “Sit. Take. Eat. 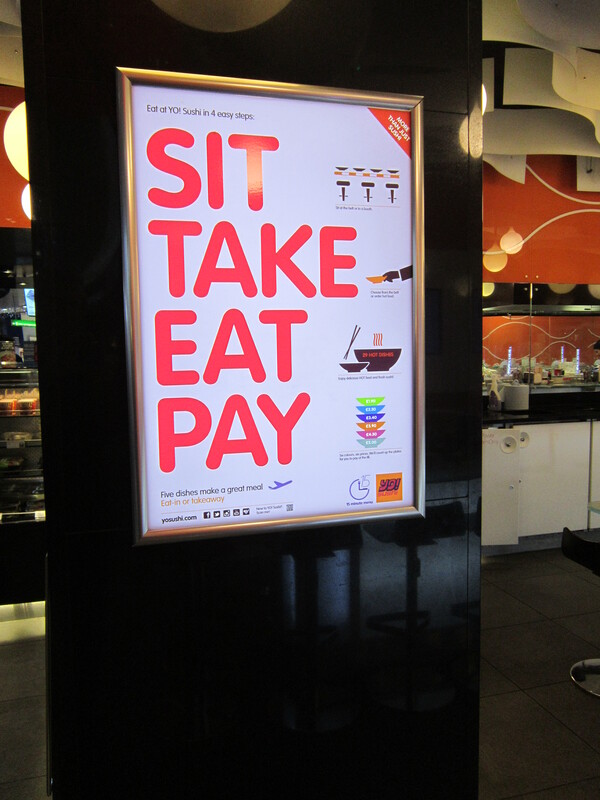 Pay.” This tagline struck me as a little robotic where food was concerned, so I took the opportunity to delve further. I quickly learned of the market niche for fast-arriving, high-quality sushi — delivered directly to you via a nonstop conveyor belt. Admittedly, for someone accustomed to working with conveyor belts in gritty industrial warehouses, the idea of pulling lunch or dinner from such a belt didn’t have strong appeal. Digging deeper, I learned of the growth of “conveyor belt sushi.” Given our fast-paced, food-on-the-go lifestyles, I can see the appeal of this for many. As Wikipedia notes, the format of the conveyor belt sushi establishment is designed “to make it easier to grab the plate as it passes by.” I am sure it does, but the words “grab” and “pass” bother me. They convey a sporting event rather than a meal. Wikipedia goes on to note that “some restaurants have RFID tags or other systems in place to remove sushi that has rotated for too long.” I’m all for food safety, but relying on an electronic scanner to keep food from getting to the table seems a bit much. Wikipedia also notes that “the final bill is based on the number and type of plates of the consumed sushi….” The word “consumed” here bothers me too. It denotes the image of food as a commodity rather than a staple of life to be celebrated (or, as my colleague Cathy Snyder of Rolling Harvest Food Rescue would say, “food is love”). Overall, these themes seem to reinforce the idea that we are increasingly disconnected from the origin of our food — and as a result we tend to value it less. And when we value it less, we waste a lot — a central theme of this blog. Over time I realized that this is precisely why the “Sit. Take. Eat. Pay” sign stopped me in my tracks at the airport. Cognizant of many of the hot button issues of our global, industrialized food system which often pit “pro-local” and “pro-production” advocates against one another — I couldn’t help thinking that strong proponents of local food systems would struggle with the conveyor belt restaurant format. In fact, I was reminded of Chipotle’s recent release of “The Scarecrow” video which (in semi-humorous cartoon-fashion) documents many of the controversial issues of our technology-driven, production-oriented global food system — including additives to beef (the video shows package labels reading “100% Beef-ish”), hormone injections to quickly fatten up chickens for market, calves kept in small cages, and vast quantities of packaged food moving through factories devoid of people and elements of nature. Notably, it depicts food being delivered to both diners and shoppers via conveyor belts. And while many would argue that a quick service restaurant like Chipotle is far from perfect regardless of its penchant for fresh ingredients, some impressions from the video regarding the global food system are fairly clear: Mechanical. Automated. Industrial. Sterile. Food is, and has long been, something to be celebrated — it is perhaps the ultimate connector. Starbucks “gets” this in its desire to be the “third place.” The word “place” implies taking the time to share and celebrate food and drink, even if only for a short time. It implies community. On the other hand, the sushi chain advocating the “Sit. Take. Eat. Pay” concept promotes the ability to “perch at the counter and grab the colour-coded plates” from the moving conveyor belt. “Perching” and “grabbing” strike me as particularly poor word choices for a dining experience, while the conveyor belt is a visible reminder of “factory” versus “field” or “ocean.” Industry versus nature. The Scarecrow video, with its depiction of packaged food, tanks, pipes, and conveyor lines, portrays a “world of pure imagination” — not something that most people would like to think about “deep down” when it comes to the food that they are eating. But it ends on an upbeat note: a drained worker returns home to a bountiful garden and is rejuvenated as he harvests and prepares freshly grown produce. The final message: Cultivate a better world. The video has nearly 14 million views at this time, with 75,000 “likes” outnumbering “dislikes” by a factor of 25 — which (arguably) suggests that there is some interest among viewers on food that is a bit more local/natural. But while there are strong opinions on the value of local versus global when critiquing the food system, we can likely all agree on the need to cultivate a better system — one which reduces food insecurity, reduces food loss and waste, and has less of a negative impact on the environment. So, back to the merger of the conveyor belt with the dinner table. I can’t help thinking that despite the appeal of quick, tasty sushi, many would find the linkage between the factory and the dinner table — as represented by the conveyor belt — to be discomforting if they thought about it a little more deeply. Perhaps the tagline concept should be changed from “Sit. Take. Eat. Pay” to “Recline. Share. Nourish. Pay.” It might not be as catchy, but it might change the way we view the food experience, and we might waste less food. At a higher level, it might even prompt us to ask: Does the conveyor belt really belong at our dinner table?